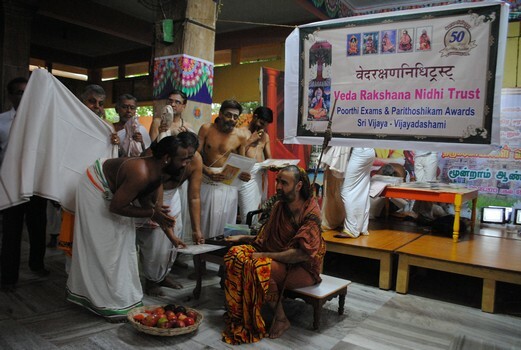 The Annual Veda Rakshana Nidhi Trust Poorthi Pariksha and Parithosikam Awads were distributed by Their Holinesses Pujyasri Jayendra Saraswathi Shankaracharya Swamiji and Pujyasri Sankara Vijayendra Saraswathi Shankaracharya Swamiji at Srimatam, Kanchipuram on Vijayadashami day. The awards instituted for various levels in the different vedic branches were given to meritorious students and outstanding Adhyapaks and scholars. The Veda Bhashya Ratna Title and Sanmaan was given to Shri. Srinivasan Shastrigal and Shri. Shankar Shastrigal of the Shukla Yajur Veda Kanva Shaka. They were given this title on completion of the 7-year Veda Bhashya (Vedic Higher Learning) Programme. The Sashtiyabdha Poorti trust provides stipend and honorarium for teachers during this 7-year study programme. The Trust was constituted in 1954 on the occasion of the 60th year celebrations of Kanchi Mahaswamiji(hence the name Sashtiyabdha Poorti Trust) to support Veda Bhashya. The Veda Rakshana Nidhi Trust is functioning since 1958. It has been rendering yeoman service in the field of Vedic Education under the guidance of the Acharyas of Shri Kanchi Kamakoti Peetam, Kanchipuram. 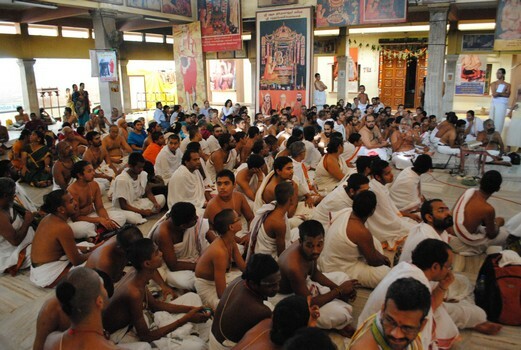 It encourages Veda Adhyayana and it runs its own Gurukula Patasalas throughout the country. An annual examination is conducted twice a year during Sankara Jayanthi in April/ May and once during Navaratri in September/ October each year. The Vidyarthi, on his successful completion of the exam is given a certificate of proficiency coupled with cash award.